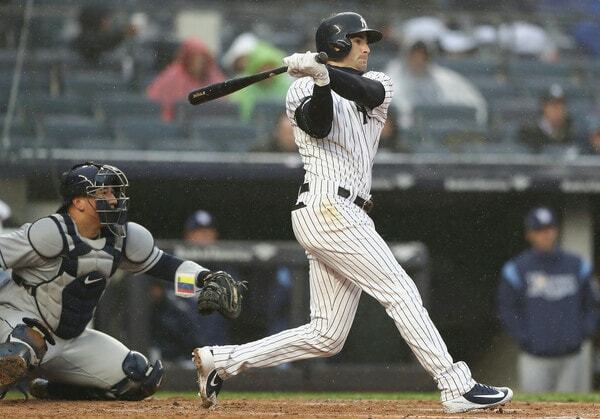 The Yankees are controlling the strike zone well this year, but should they be a little more aggressive? Nothing has come easy for the Yankees two weeks into the 2018 season. They’re dealing with injuries, Giancarlo Stanton and Gary Sanchez have mostly struggled, and the bullpen has been an unexpected weakness. That they’re 6-6 after 12 games even though it feels like everything is going wrong tells you this squad is pretty good. If these are the bad times, they’ll be a-okay over the long haul. Among the things currently going wrong: Tyler Wade and Miguel Andujar. Injuries have forced the Yankees to give Wade and Andujar starting infield spots — Greg Bird’s injury pushed Neil Walker to first and Wade to second, Andujar is replacing Brandon Drury — and so far the two 23-year-olds have gone 6-for-55 (.109) with four walks. That works out to a combined .109/.167/.145 (-16 wRC+) batting line. Yikes! Pitchers are hitting .143/.170/.206 (5 wRC+) so far this year. Yeah. Wade and Andujar have had their moments. Wade drove in what proved to be the winning run in the second game of the season against the Blue Jays, and his defense at second has been pretty excellent. Andujar has been the starter for only four games now and he had two hits (plus a walk) and drove in two runs in a game against the Orioles over the weekend. That’s not much, but it’s something. They haven’t been total zeroes, but they have been close. The Yankees are, for the most part, a team that is built around youth. They re-signed CC Sabathia because they needed another starter and there’s something to be said for the intangibles he brings. They signed Walker because he fell into their laps. Otherwise, they’re going young wherever. Brett Gardner and Walker are the only over 30 starting position players and Sabathia is the only over 30 rotation member. Complete opposite of a few years ago. And, when a team goes as young as the Yankees, there are going to be bumps in the road. We saw it with Aaron Judge two years ago! Look at him now. Luis Severino had to endure a rough 2016 season before breaking out in 2017. Even the best young players have growing pains. That isn’t to say Wade and Andujar will be the next Judge and Severino — Judge and Severino are truly elite payers — just that young players often make you wait for the reward. One one hand, Wade and Andujar have 131 combined big league plate appearances (93 by Wade), which is nothing. Young players need time to develop and, thanks in part to the injuries, the Yankees are giving Wade and Andujar that time to develop, for better or worse. On the other hand, the Yankees are aiming for a World Series title this year, and step one in the process is making the postseason. Wade and Andujar have hurt that cause in the early going. Here’s the thing though: The Yankees can’t really replace Wade and/or Andujar even if they wanted too. I suppose they could send one to Triple-A and make Ronald Torreyes a starter — I guess that means Jace Peterson on the bench? — or they could call up Gleyber Torres, which would be fun. But what happens if Gleyber starts his career 3-for-30 and in two weeks we’re writing about his early struggles and how they’re hurting the team? I am pro-Wade and pro-Andujar. Bird isn’t coming back anytime soon and who knows what’s up with Drury. The second and third base jobs are open for the foreseeable future, and since the Yankees have lots of firepower higher in the lineup, there’s some wiggle room to break in some kids in the eight and nine holes. This was basically the argument over the winter, right? Before the Drury and Walker deals? Let the kids learn on the job. The Yankees did not like letting the kids learn on the job be Plan A and I don’t blame them. Going into the season with two rookies on the infield and no real backup plan never seemed all that likely. Injuries have forced Wade and Andujar into everyday duty early on though, and so far, neither has played all that well. You can see the potential — Wade is such a great athlete and Andujar’s hands are lightning fast — but that potential hasn’t equaled production. Neither Wade nor Andujar has played well in the super early going and they are part of the reason the Yankees are 6-6 instead of, say, 8-4. Only a small part, I’d argue. Stanton and Sanchez slumping and the bullpen melting down are the biggest reasons, I’d say. That doesn’t absolve Wade and Andujar of blame. They’re getting a chance to play right now, on an everyday basis, and neither is doing much. It doesn’t mean they’ll be bad forever, but the sooner they play well, the better. Both have a great opportunity right now and they want to take advantage.